Love, Lenore: floral & lace. Braided suede bracelets: H&M. Rose ring: Forever 21. Green stone ring: H&M. Gold seashell bracelet: Vintage. 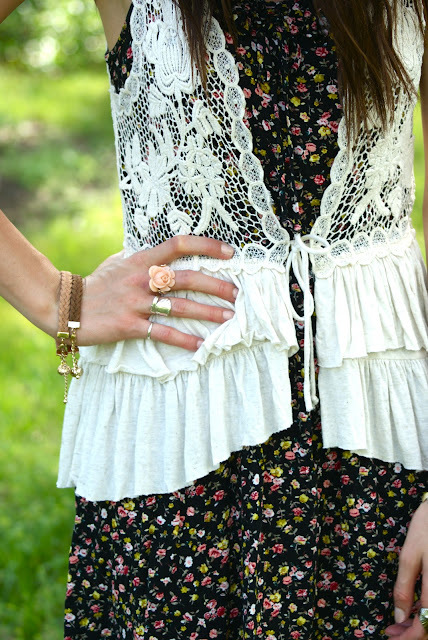 Lace ruffled vest: Forever 21. Floral sundress and black braided sandals: Target. I scored this cute little sundress last summer at Target for somewhere around $20 and love its defined waist and how simple it is to throw on. However, I've been pushing myself to work with layering lately (not typically a strength of mine) and this adorable lace vest has been hanging in my closet just waiting for an opportunity to shine. I like these together because they really change up this otherwise simple dress, making it possible for me to wear it two different ways! Love this look. The lace waistcoat works amazingly with the floral dress, you look so good. but it looks really really nice! I love the floral dress. Super cute look! Love your vest! Sweet look- the vestlet is cute! I like the location of the photos too! I can totally see you rocking this at Coachella! LOL! I love the two paired together it's so bohemian and feminine at the same time, and that vest is really beautiful! Have a amazing weekend gorgeous! This is an amazing combination!!! I love that dress and the crochet vest together!! Love the lace and floral combo, such a fun summer look. I love this outfit, you look so pretty! I LOVE that white lace vest, so cute!